Exhibit 22 – The famous bathmat. I took a towel from her bathroom, but in less than a minute it was all soaked. I took another, but it was no use. I left the house in shock. I was outside, but didn’t know where to go, seeing still all that blood. It was all so red. I thought of going home. I had wet trousers and tried to cover it with the sweatshirt. There were a lot of people in the street, in Piazza Grimana. There were some guys still playing basketball even though it was dark. Sollecito: [The door] of one of the flatmates who isn’t here and we don’t know where she is. Police: And there are blood stains outside the door of this flatmate who’s not there? Sollecito: The blood stains are in the bathroom. Police: Oh in the bathroom. And this door is closed. And this girl, do you have her mobile number, her …? Sollecito: Yes, yes, we tried to call her but she’s not answering. Would a guilty Raffaele Sollecito really be telling the police about blood stains in the bathroom where his bloody footprint is? Original position of the bathmat, as recognized in the bathroom in the process of site inspection. The prosecution went to great lengths to show the partial print on the mat was made by Raffaele Sollecito after all of the other bloody prints were proven to belong to Rudy Guede. In a 2nd deposition in May 2008, Rudy Guede finally admitted the bloody shoe prints were his. Judge Massei concluded the bathmat print wasn’t Guede’s because his shoe prints led straight out the front door. This reasoning is far too simplistic because the shoe print pattern of Rudy Guede in the cottage is incomplete and there’s no way of knowing exactly what actions Guede took based solely on his shoe prints. Proper inspection of the bathmat clearly shows the tip of the second toe blended with the top of the big toe. Rinaldi measured the big toe including the top of the second toe. This error caused the width to measure 30mm. The error in measurement is crucial because Rinadli and Boemia based their “probable identity” conclusion on compatibility with the width of Raffaele Sollecito’s big toe. 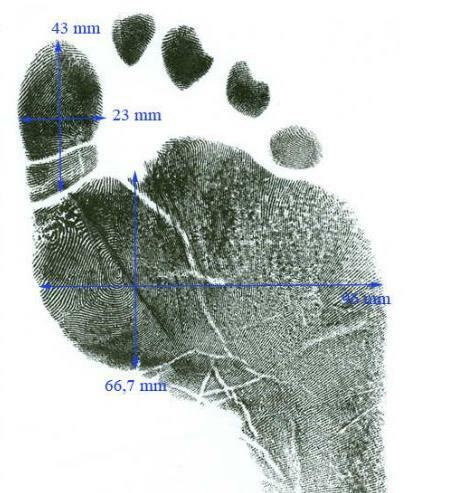 When measured correctly, the width of the big toe is 24.9mm and therefore incompatible with Raffaele Sollecito’s at 30mm. It’s impossible Raffaele’s foot made the print. The photo below shows the area of the print that was measured incorrectly by Rinaldi. 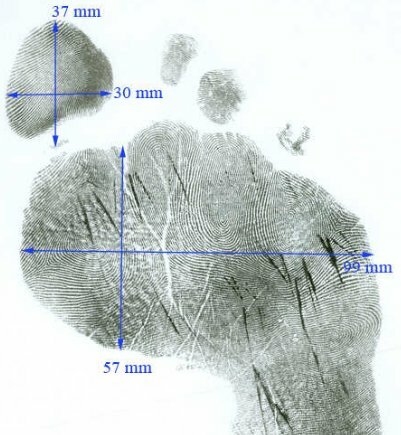 As can be seen from the sample prints, the actual measurements are similar to Guede’s footprint. 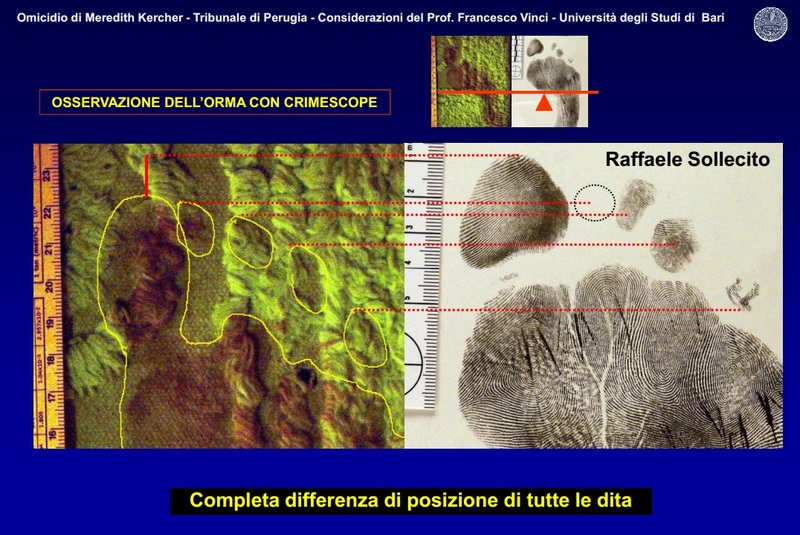 The photos below are not to scale with the bathmat image and are posted only to observe the different characteristics and to point out the obvious error in measurement by Rinaldi. Note – There’s an error in the Massei Report on page 339 and in the Hellmann Report about the width of the big toe according to Rinaldi and Boemia. Both motivation reports mistakenly say Rinaldi and Boemia claim it’s 33mm yet in their report on page 73 it’s 30mm and that’s what they testified. Choice of system of measurement: The Scientific Police did not indicate their method of measurement. Sollecito Defense: Seeing as now the consultant is telling me quite correctly that there is a toe missing, I wanted to know if during this analysis, seeing as it’s only a morphological analysis, etc, if the fact that this toe was missing had any effect [on the conclusions of the analysis]. Judge Massei: You mean absolutely not? Rinaldi Lorenzo: Absolutely not; no, we never took into consideration the position of the toes. Sollecito Defense: So this judgment that you arrived at does not take into consideration the position of the toes, the axial position, the papillary ridges and whether the subject was on two feet or on one. Judge Massei: However excuse me, was the direction of the big toe visible on the bathmat? Rinaldi Lorenzo: I repeat, we didn’t consider it, and neither do we hold that it was identifiable in our analysis, because I hold that it requires knowledge of orthopedics. Sollecito Defense (Att. Bongiorno): If it was in the middle of the mat it could be a foot standing on its toes or a foot part of which was not stained with blood, or else if it was on the edge already there are differing consequence; you know where it was placed? Pietro Boemia: It was at the edge of the bathmat, towards the corner. Sollecito Defense: Therefore it was on the edge part of the bathmat? Sollecito Defense: How do you know it was on the edge part? Have you seen the bathmat? Pietro Boemia: No, that is I’ve seen it in photos. Question: Do you know if special apparatus had been used to take these photographs, or just a simple camera? Answer: As I’ve told you in short I don’t know where the photo was taken, I can’t tell you what type of equipment had been used. Judge Massei: Yes, he wasn’t there. 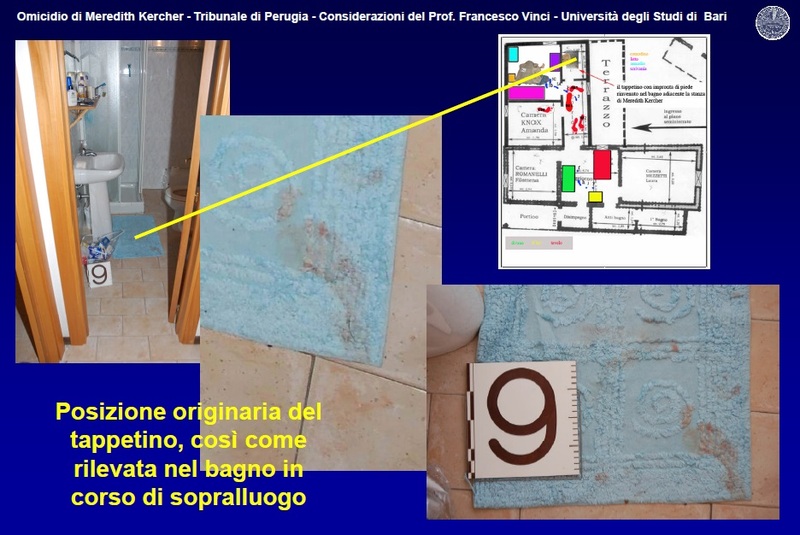 Professor Vinci [Sollecito defense consultant] clearly demonstrated the print on the bathmat did not belong to Raffaele Sollecito. View all translated pages from Professor Vinci’s report here. Page #26 from Professor Vinci’s report. 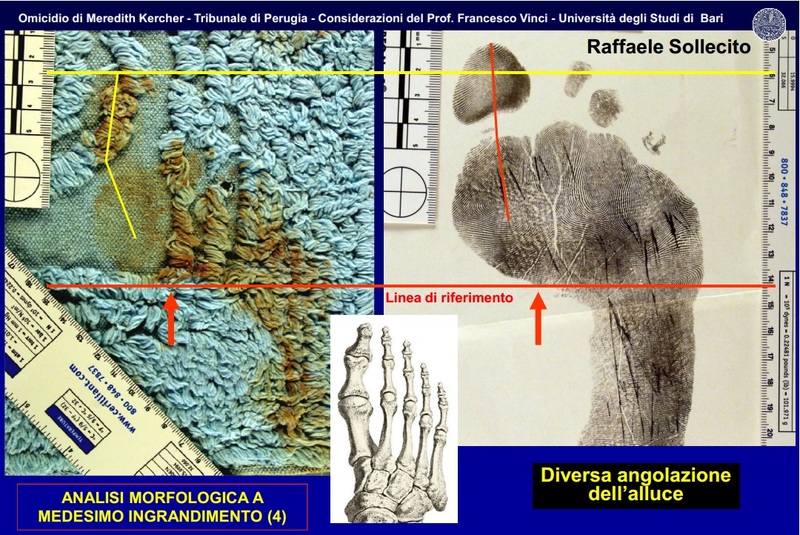 Translation: Morphological analysis with equal scale (4): Different angle of the big toe. Page #29 from Professor Vinci’s report. Translation: Entirely different positions for all toes. Page #39 from Professor Vinci’s report. Translation: Difference in values. Variation of more than half a centimeter. One of the analysts , Lorenzo Rinaldi, was a physicist, not a specialist in anatomy, and the other, Pietro Boemia, was a fingerprint technician with no further scientific credentials. That begged the question: if Mignini’s office felt it needed to contract the job out to private consultants, why wouldn’t it go to people with more pertinent qualifications? The whole thing stank. Gumbel, Andrew; Sollecito, Raffaele (2012-09-18). Honor Bound (Kindle Locations 2088-2091). Simon & Schuster, Inc.. Kindle Edition. The professor furthermore supports the theory that the technical investigations in question belong to the domain of forensic medicine, as they require mandatory orthopaedic and anatomical knowledge. 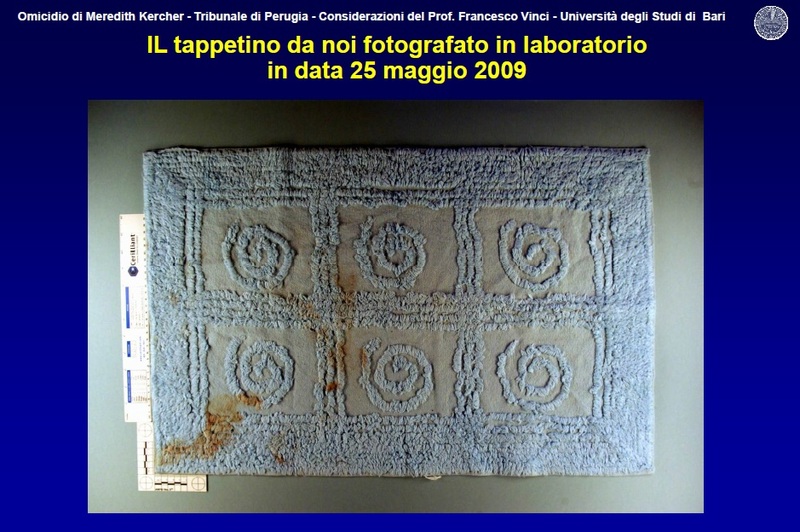 He then criticised the fact that the investigations were conducted uniquely on the basis of image analysis (Dr Rinaldi did state that he had not seen the crime scene, as he did not participate in the inspections, and that he worked only with the photographic materials that had been made available to him, which in particular required correcting the perspective of the tiles because the snapshots are not perfectly perpendicular), without any direct examination of the bathmat on which the footprint was actually found. The above-mentioned differences led the technicians to conclude that there was compatibility of imprint “A” on the mat with regard to the general characteristics of shape and size with Raffaele Sollecito’s right foot, and this outcome allowed them to express of an opinion of probable identity; at the same time they arrived at a finding of non- compatibility of print ‚A‛ with Rudy Hermann Guede’s right foot (page 44 transcripts).